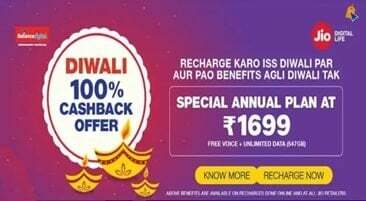 Reliance Jio has launched its new plan Rs.1699 on Diwali as Jio Diwali Dhamaka 2018 Offer. You will get 100% cashback and 1.5GB 4G internet for 1 year. This Diwali is very special for Reliance Jio user as its most beneficial plan is launched for its customer. Reliance Jio always gives surprise to its consumer with the special offer. No need for any festival or any special occasion. Jio Diwali dhamaka 2018 offer with 100% cashback. I think all of you interested to know, what does it mean? It means FREE recharge plans for one year but has certain terms and conditions. Jio introduces this plan priced Rs.1699 with a 547GB data plan for one-year validity. Data limit 1.5GB/ day for 365 days and unlimited call to any network with 100 SMS/ day. What is Jio Diwali 100% cashback offer? In simple words, the cashback amount will be credited in the form of Reliance Digital coupons in MyJio app. You can use this cashback amount later at reliance digital store. The offer is only available between 18th October and 30th November. Also, you can use the 100% cashback offer is also applicable to other recharge options of Rs.198, Rs.299, Rs.349, Rs. 398, Rs.399, Rs.448, Rs.449 Rs.498, Rs.509, Rs.799, Rs.999, Rs.1999, Rs.4999 and Rs.9999. The best offers for Jio recharge available here. The coupon is available on this Jio Diwali cashback offer, you can use at any Reliance digital store. Minimum purchase value should be Rs.5000. Everything you will buy from Reliance digital store except Gift vouchers and cards of KFC or Cleartrip. You also can not buy smartphones like Xiaomi, Samsung. There are some electronic products listing, you can not buy. At a time two coupons can’t be redeemed. Use this coupon before 31st December 2018. Otherwise, the coupon code will expire. First thing is you will get 100% cashback as coupon voucher. If you will recharge this Rs.1699 plan, you will get two vouchers of Rs.500 and one voucher for Rs.200. At a time you can’t use this two coupons on a single product. Suppose you are buying a product of Rs.7000, you got a discount of Rs.500, not Rs.1000. So, only one coupon will be used on a product or recharge. Yes, you also redeem this coupon on your next recharge and get discount. Assume, recharge done by you Rs.1999, then you will get Rs.500 discount. The effective price will be Rs.1499.